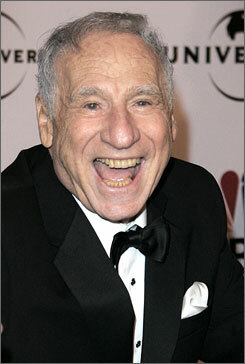 Tony Award winner Mel Brooks, composer of Broadway's The Producers and Young Frankenstein, was honored with a star on the Hollywood Walk of Fame April 23, according to AP. Brooks was the recipient of the 2,406th star. Attending the ceremony in front of the Egyptian Theatre were Brooks' son Max and friend Carl Reiner. A noted comedian, writer, producer, director, composer and actor, Brooks won an Academy Award for the original story and screenplay of the 1968 version of The Producers. He also earned nominations for the adapted screenplay of Young Frankenstein, with Gene Wilder, and for the lyrics to the title song from Blazing Saddles. The Critic, for which Brooks provided the narration, won an Oscar for Cartoon Short Subject in 1963. Brooks won Tony Awards for Best Musical, Best Original Score and Best Book of a Musical (with Thomas Meehan) for The Producers. He is one of only 12 individuals to have won all four major show business awards – the Oscar, Emmy, Grammy and Tony. The 83-year-old Brooks is currently working on a musical version of Blazing Saddles. What in the hell took them so long? Congrats, Mr. Brooks!